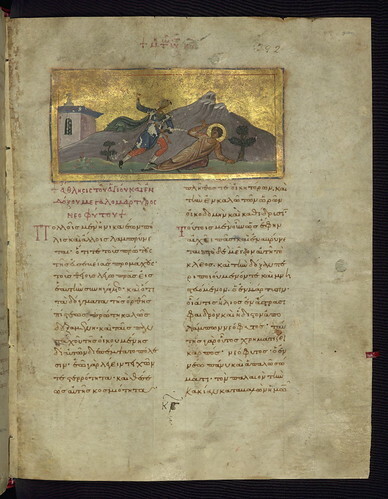 Imperial Menologion, Exploit of the Holy and Glorious Great Martyr Neophytus, Walters Manuscript W.521, fol. 200r, originally uploaded by Walters Art Museum Illuminated Manuscripts. This manuscript contains the biographies of saints whom the Church commemorates on January 1 through January 31. It was originally part of a set covering the entire year. A companion volume, with texts for March, survives now in Moscow (State Historical Museum, MS Synod. gr. 183). Each chapter in both manuscripts opens with a miniature depicting the death of the respective saint, or less often, another significant event from her or his life. Each text also ends with a seven-line prayer for the well-being of an emperor whose name is spelled by the lines' initial letters as MIChAEL P. This is almost certainly Michael IV, who reigned in 1034-41. The meaning of the letter P is not quite clear. When first used, the books were evidently read out in the emperor's presence, probably in one of the numerous chapels of the great imperial palace in Constantinople, capital of the Eastern Roman Empire. A single leaf from the Walters volume is now kept in Berlin (Staatsbibliothek Preussischer Kulturbesitz, MS graec. in fol. 31). The manuscript had lost folia by the sixteenth century, and paper leaves were added at this time, copied from a Metaphrastian Menologion.